Leaving, on a jet plane…. Or a train, submarine, or motorcycle. Vacation station deluxe is all about travel. The game’s background noise is the sounds of a train station, or airport tannoy announcing departures, and all the symbols are different modes of transportation. This slot is a bit different from the standard three reel, three row machine. For a start, it has much nicer graphics than many of its peers. We’re used to seeing very stripped back artwork on such titles but Vacation Station Delixe breaks the norm. Playtech have taken the very basic gameplay of their other simplified titles, the likes of Tres Amigos for example, and added a slightly different win line dynamic. The effect is a machine that has the simple appeal of the most basic games but modernised graphics, and a much more developed gameplay experience. Great take on an old game format. Good sized prizes for such a simple game. Graphics are much sharper than other games of this simplicity. Absolutely massive upper betting limit. £2,400 on one of these three reel machines is completely unheard of. No game features. Whilst this is clearly a deliberate omission, it will certainly put many players off. Hitting three jet aeroplanes will win 1,000x the line bet when betting one coin per line, 2,000x the line bet when betting two coins per line, and 4,000x the line bet when betting three coins per line. Hitting three ferries will earn players 750x the line bet when betting one coin per line, 1,500x the line bet when betting two coins per line, and 2250 when betting three coins per line. Hitting three yachts will pay 500x the line bet for one coin, 1,000x the line bet for two coins, and 1,500x the line bet for three coins. As you can see, there is a bonus win for the highest value symbol on the game when using three coins per line. This means that to achieve the advertised return-to-player rating, you must use the maximum bet of three coins on every spin. 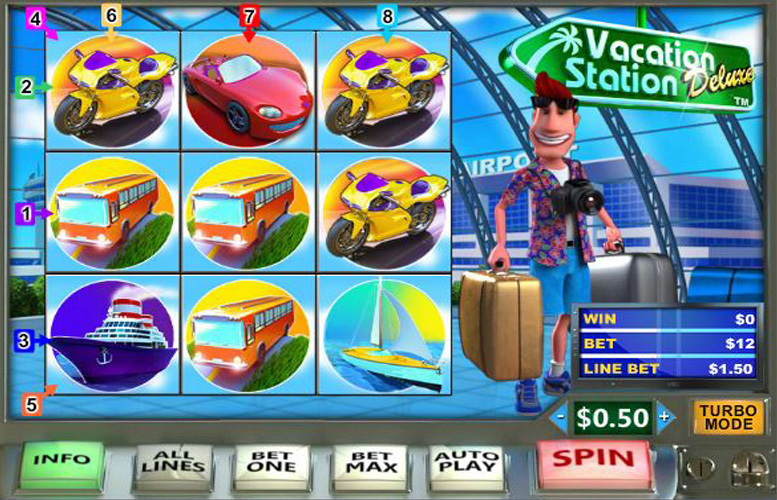 The only real gameplay feature on Vacation Station Deluxe is the fact that win lines run horizontally and vertically. This is one of the few slots to utilise such a dynamic and it really helps breathe life into a tired genre of three slots. Such games are hard prove difficult to modernise whilst retaining their original simplicity. Hot air balloon = 750x the line bet. Submarine = 300x the line bet. Sports car = 240x the line bet. Motorcycle = 180x the line bet. Train = 120x the line bet. Bus = 75x the line bet. 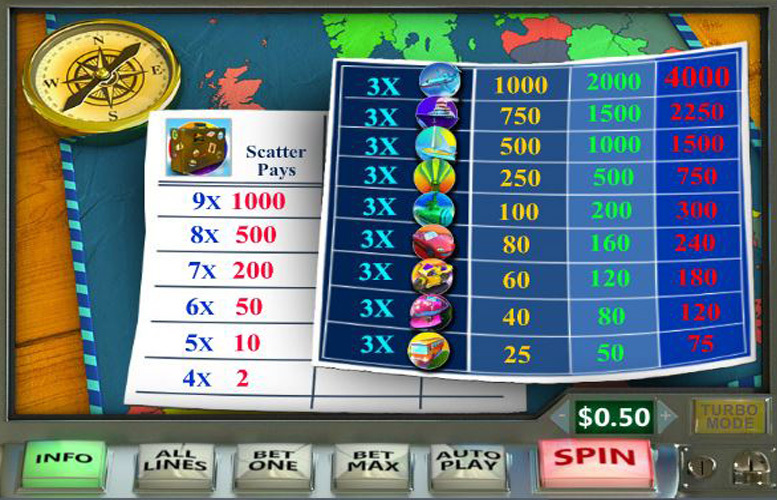 Players can bet one, two, or three coins per line, and all the lines are fixed. They can also vary the value of each of the coins between 1p, and £100. This means that the minimum possible bet is just 8p, and the largest is a huge £2,400. Despite how badly we usually rail against three reel machines, we really like this one. It’s a great effort at revitalising the often-forgotten slot styles of yesterday. With its massive RTP, vertical win lines, simplistic gameplay, and potentially large top prizes, it’s certainly worth a few spins. This game has a rating of 5 / 5 with 631 total reviews by the users.